AutismOklahoma (AO) is a 501c3 non-profit organization that believes every person with autism is unique and important. The organization provides programs that help individuals with autism reach their full potential, families thrive and communities understand and embrace differences. Today, 1 in 59 children is diagnosed with autism, therefore AO seeks to serve and support more families than ever before in the state of Oklahoma. AutismOklahoma’s PieceWalk & 5K is the largest autism awareness event in Oklahoma and is designed to improve autism awareness and garner support for individuals with autism and their families. The fundraising from this annual event is nearly half of the organization’s annual budget. Koch Comm partnered with AO in fall 2017 to support the 2018 PieceWalk & 5K campaign efforts through search engine marketing, social media advertising and management, search engine optimization, overall digital strategy and reporting. When the partnership between Koch Comm and AO began, six primary challenges were identified. Each of the challenges was related to the organization’s goals for the campaign. Those challenges included: Helping the organization approach campaign planning in a structured and integrated manner; growing the PieceWalk & 5K participation beyond the organization’s strong core demographic; increasing awareness of autism to the community at large; developing effective strategy despite the late start to the campaign and little lead time before launch; meeting the aggressive fundraising and participation goals; and identifying meaningful metrics for reporting results. Koch Comm was brought into the campaign less than a month before its start date and took an aggressive approach to learning about AO, the event and those that it benefits. Koch Comm conducted a discovery process and was able to produce a holistic digital strategy for the campaign. AO’s transparent and enthusiastic team provided opportunities for Koch Comm to connect with the event and the organization’s goals. This helped shape the digital plan and gave the Koch Comm team the knowledge to be able to ramp up implementation in line with the campaign’s launch date. The overarching digital strategy sought to integrate Koch Comm’s services with the digital and traditional services the AO team was managing internally. This strategy identified strengths and weaknesses, current and future target audiences and markets, a digital advertising strategy, search engine optimization recommendations, measurement strategy and a timeline for the entire campaign. Additionally, Koch Comm built a communications matrix that helped AO identify all of its different communications vehicles, the target audiences and the optimal time to use those vehicles and what messages should be communicated using each vehicle. Koch Comm used the AO contact databases as an initial audience for social ad targeting, and also worked to build beyond the core demographic through SEM. Keywords related to the 5K helped connect people who previously had not been a part of the 5K with the race, with impressive results. Additionally, Koch Comm used a mix of content to help social audiences more easily connect with the message and ultimately participate. This included personal story videos, humorous PieceWalk & 5K event updates, information about AO programs, as well as general information about the event. By creating concise and clear messaging across all digital media ­­– which supported the goal of expanding awareness of autism, the event, and the AO programs – and intentional ad targeting, Koch Comm was able to push content in front of more people than AO’s digital channels had ever seen. The digital strategy developed, executed and integrated with other marketing efforts pushed the PieceWalk & 5K to experience greater success than ever before. – Digital media played a crucial role in the success of the campaign, led by more than 9,000 referrals to the PieceWalk & 5K website from the event’s Facebook page as well as nearly 2,700 referrals from SEM efforts. – Nearly 15,000 people visited the PieceWalk & 5K website, churning through more than 84,100 pages of content. – Successful implementation of Facebook fundraisers for the PieceWalk & 5K as well as the donation functionality – both items that they had not previously used. – The PieceWalk & 5K saw more than 1.6 million total impressions of content from its Facebook page, including a staggering 682,215 in the month of April alone, giving AO and the PieceWalk & 5K a much greater exposure to a wider audience. The PieceWalk & 5K had, for nine years, never exceeded the $200,000 donation threshold. 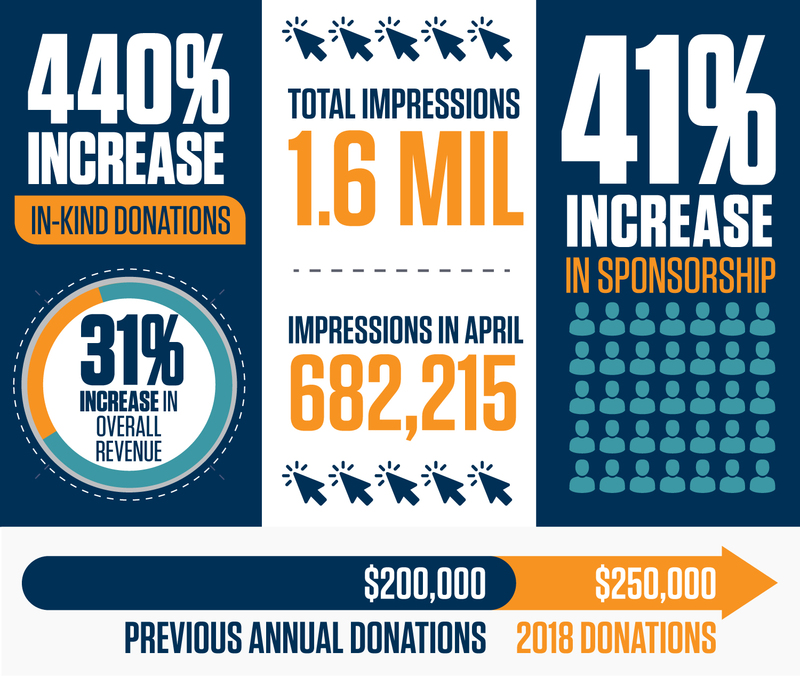 The AO team set a goal of $250,000 for the 2018 campaign with very aggressive monthly marks. The success of the campaign, and the partnership between Koch Comm and AutismOklahoma, resulted in surpassing the $250,000 goal.